UPDATED: Wed., Nov. 7, 2018, 2:38 p.m.
FLOWERY BRANCH, Ga. – The Atlanta Falcons made a move to bolster their lackluster pass rush by agreeing to a one-year deal with defensive end Bruce Irvin on Wednesday, reuniting the veteran with coach Dan Quinn. Irvin, cut by the Oakland Raiders on Saturday, became a free agent after clearing waivers on Tuesday with $3.8 million remaining on his contract. The Falcons play at Cleveland on Sunday. Irvin was expected to arrive in Atlanta on Wednesday night and join practice on Thursday. Quinn said Irvin will play against Cleveland. The Falcons rank 27th in the league with 17 sacks. Takk McKinley has a team-leading 5 1/2 sacks, but Vic Beasley has only one. Beasley led the league with 15 1/2 sacks in 2016. Quinn said the homecoming and the chance to play in a familiar scheme were motivating factors for Irvin. Quinn said Irvin also is motivated to show he can be a successful pass-rushing end after being waived by the Raiders. The Falcons’ defense had more good news on Wednesday. Linebacker Deion Jones, who has been on injured reserve since suffering a foot injury in the season-opening loss at Philadelphia, returned to practice. He is not eligible to return until next week’s game against Dallas and has not been placed on the active roster. Quinn said Jones’ snaps in practice will be watched closely this week. He said he has no timetable on Jones being cleared for a game. The Falcons (4-4) have won three straight despite losing starting safeties Ricardo Allen and Keanu Neal to season-ending injuries. Starting guards Andy Levitre and Brando Fusco and running back Devonta Freeman also are on IR. Irvin played with Seattle when Quinn was the team’s defensive coordinator. Irvin had three sacks with Oakland, but played only nine snaps in a 34-3 loss to the San Francisco 49ers on Thursday night. Irvin (6-3, 250) played four seasons with Seattle before joining the Raiders in 2016. He had eight sacks as a rookie in 2012 and matched that career high with Oakland in 2017. He set a career high with six forced fumbles in 2016. His 11 forced fumbles since the start of the 2016 season are the most in the NFL in that span. For his career, Irvin has 40 sacks and 15 forced fumbles. Oakland was expected to enter the season with Irvin and Khalil Mack leading the defense as bookend pass rushers. Instead, Mack was traded to Chicago a week before the season for a package of draft picks following a lengthy holdout. 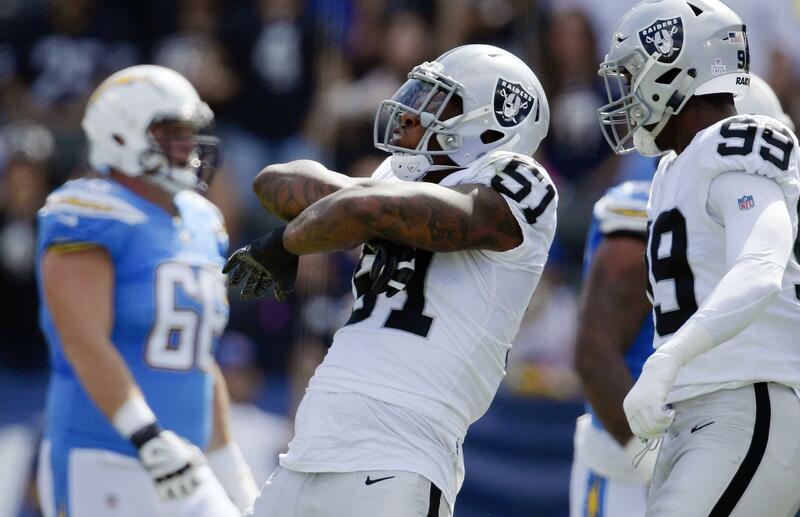 The Raiders rank last in the league with seven sacks. Published: Nov. 7, 2018, 9:21 a.m. Updated: Nov. 7, 2018, 2:38 p.m.